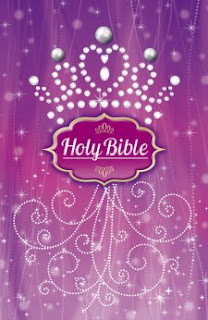 Book Review: "Holy Bible" Princess Style! Purple, pearls, and princesses! Little girls will love this brand-new version of the International Children’s Bible®. The ICB® contains Bible text at a third-grade reading level, and the cover is decorated with the popular purple-and-pearl trend little girls will love. Thank you Booklook program for sending me this bible free of charge in exchange for an honest review. I was not paid for this review and all opinions expressed are 100% mine. I have a girly girl and her mouth dropped open wide when she saw this fancy pretty princess looking Bible! It has a crown with fancy looking pearls attached and sparkles throughout the entire cover. When you open the Bible there is more purple and sparkles on the presentation page. This Bible also includes a "Family History" and "Why should I read the Bible" sections. After you get past those couple pages you reach a really fun time line with pictures. Once you go a little further there is a preface that explains this version of the bible. It says, "The International Children's Bible is not a storybook or a paraphrased Bible. It is a translation of God's Word from the original Hebrew and Greek languages. It is the first translation of the Holy scriptures prepared specifically for children. Another neat feature this Bible has is a "Key Verse Hightlights" section. So if your child would like to learn about anger, mercy, or salavation they can just go to this section and it will guide you to different scriptures to look up. I remember doing this as a kid. I would pick a topic and read all the scriptures on a certain topic... and it was actually very helpful for me. We are going to get a lot of good use out of this Bible! My daughter is a 2nd grader and this is a great book to transition to after storybook bibles!